With the Landcruiser packed to the brim and the camper trailer hooked up, we set off on Saturday, 1 July, with our daughter and son-in-law in the back seat, headed for Birdsville. 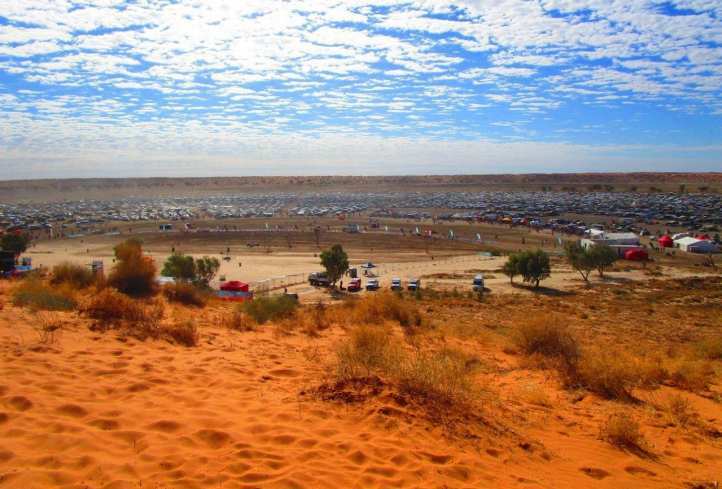 We had decided to attend this year’s Big Red Bash, the world’s most remote music festival, held in the heart of Australia’s outback at Big Red, 35km out from Birdsville. The price of the tickets included entry and camping fees. It’s a huge feat for the organisers to set up a mini-town in the middle of nowhere for 7000 people. All staging, lights, generators, portaloos, rubbish bins, tents, furniture and everything else to run a big event for three days, has to be freighted in. Lots of people volunteer to work at the event in lieu of paying for tickets. After seeing what some volunteers have to do, I’m rather pleased that we forked out $400 a ticket! The journey is all part of the adventure when getting to the Bash. Our first night was out from Port Pirie, as we’d had a late departure. We travelled well the following day, stopping to visit Talc Alf and his artworks, at Lyndhurst, as well as buying lunch at the Farina Bakery, which was quite a popular place. We made good time, stopping overnight at the Mungerannie Roadhouse, which was charging camping fees of $10 per person. They would have made a killing, with all of the travellers passing through for the festival. 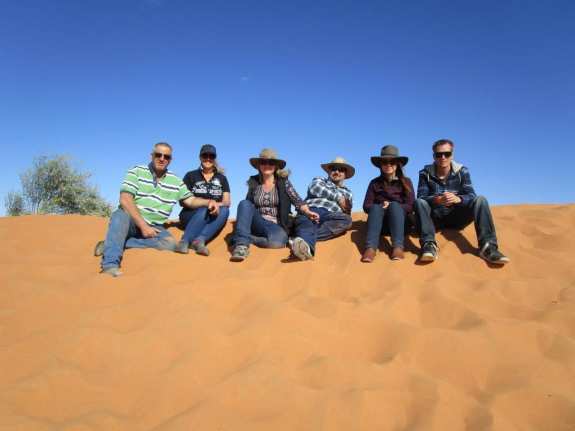 On Monday, we arrived in Birdsville and met our friends from Burra, who were camping out near the racecourse. Since Big Red was closed for camping until Tuesday, we joined them on the common and set up for the night. Since this was my first trip to Birdsville, I was quite surprised that the town centre looked clean and green. It’s just a pity I had to share the experience with another 6000 other people! There were queues for fuel; queues for toilets; queues at the hardware store; the bakery; the pub… Everywhere! We got up early on Tuesday and popped into the town to have a $5 shower before having breakfast and packing up. Although there was a steady stream of traffic and dust on the road to Big Red, it didn’t take too long before we’d arrived at “Bashville” and set ourselves up. 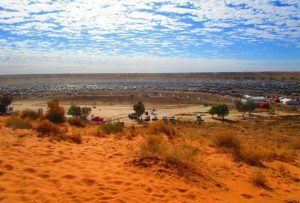 There are strict rules for camping: BYO wood, water and supplies; take out your rubbish; leave no trace (including grey water). No vehicle movements are allowed, once camped, until 7am Friday morning. The three-day festival, now in its fifth year, featured some of Australia’s best-loved country and rock musicians. This year’s line up featured Missy Higgins, Lee Kernaghan, James Reyne and Mark Seymour, as well as performances by Ian Moss, Ray Ryder, Kate Ceberano, Russell Morris and more. A few dedicated fans sat outside the concert area for hours, waiting to get front row seats but, with entertainment on stage from about 1pm til 9pm, there was plenty of space to set up and watch the performances. The mornings were free to walk around the campgrounds or climb Big Red and take in the scenery. I was sitting on the top of the sand hill when the song, “Great Southern Land” was played over the speakers, one morning. It was a bit surreal… perfect timing. The footsteps of 6000 people tracking up and down the pathways, between camp sites, created huge amounts of fine dust, which hung in the air over the camp grounds. That, coupled with the smoke from a thousand camp fires, created an atmosphere that made it tough to breathe, even for those that don’t suffer from asthma. The toilets were few and very far between (always a problem! ), and it was necessary to take your own loo paper, just in case… Other than that, everything else was pretty good. 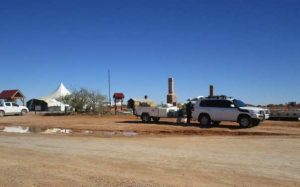 On Friday morning, once the festival finished, camps had to be packed up and cars headed out in a steady stream, back to Birdsville. It was like being in a dodgem car, trying to keep out of the dust of the car in front. Once back in the town, we paid to have another shower and bought morning tea at the Bakery, before getting back into the traffic (!) and headed back down the Birdsville Track. It paid to be patient with the amount of traffic on the track but most people were courteous and allowed safe passing, when required. up a stone that hit our rear windscreen, shattering it. Mark taped it up and we continued on our way, camping at Farina on Friday night, and Burra, the next, before reaching home on Sunday. Overall, we really enjoyed the experience of this unique music festival and camping in the Simpson.